If I’m not mistaken, I acquired this game at the 2014 Oklahoma Video Game Expo for about a buck. That was many months ago now and I’ve yet to play it. I don’t anticipate playing it anytime soon either. 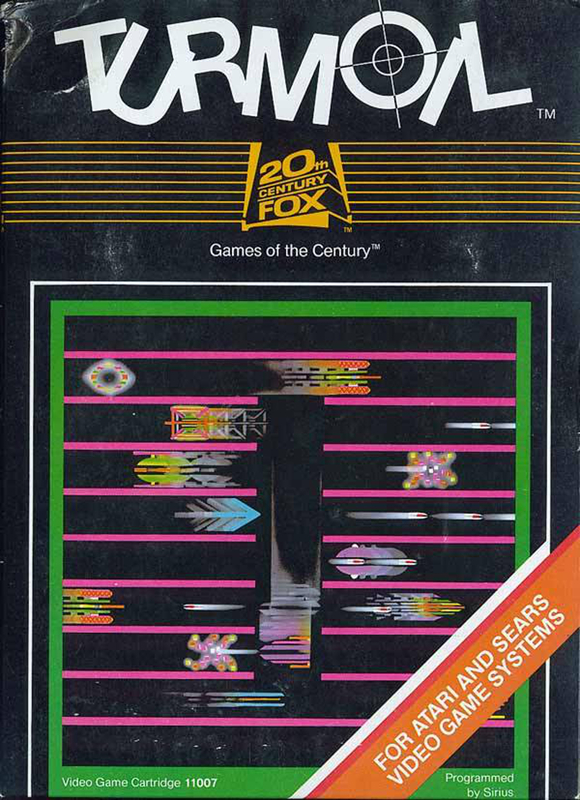 It looks like a fast playing shoot ‘em up for the Atari 2600, not too dissimilar from Tempest. The player’s ship remains in the center of the screen, surrounded by about five pathways on either side. Enemy ships zoom between each side of the screen while the player attempts to stay alive by destroying or avoiding them. Perhaps the most interesting factoid about Turmoil is the fact that it was designed by Mark Turmell. He later went on to design Smash T.V., NBA Jam, and NFL Blitz, among others. He was working for Sirius Software at the time and the game was published by 20th Century Fox. It was released in North America around 1982 on the Atari 2600. It also had releases on Atari’s line of 8-bit computers, the Commodore VIC-20 and C-64, and on MSX computers. Thanks to Atarimania for hosting this image of an autographed copy of the game. Beamrider represents a first in my articles over Activision Anthology. 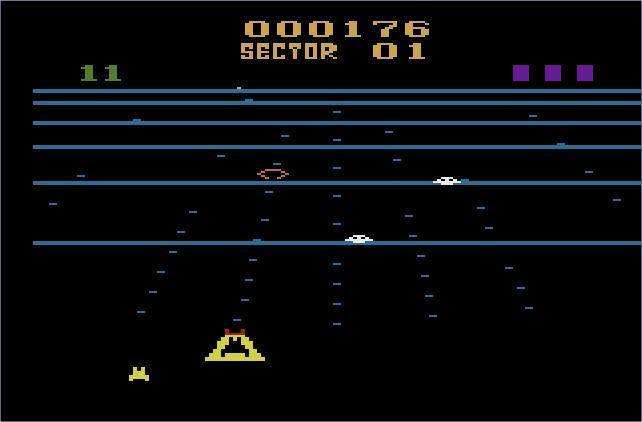 It is the first game in the compilation that was not originally developed for the Atari 2600. It was originally released for the Mattel Intellivision and later ported to Atari’s platform and a host of its contemporaries. Designed by David Rolfe, it doesn’t appear that he was an employee of Activision but rather worked for Cheshire Engineering, a contractor of sorts. 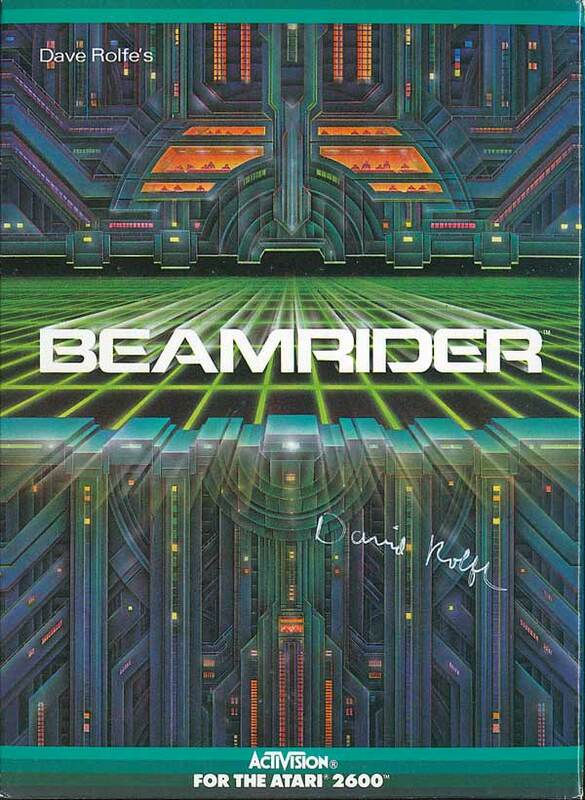 Beamrider was released for the Atari 2600 in 1983 and plays like Tempest. Players control a light ship as they venture through an abstracted and simplified outer space. Riding on and jumping between five separate beams, players must destroy fifteen enemies per stage before hightailing it back to the space station and getting one step closer to the desired Restrictor Shield. The action can be confusing and hectic, but the game holds up. It’s not my cup of tea however, even though I have a preference for shoot ‘em ups. Its setting was not as quirky as some of the other shoot ‘em ups I played on this compilation and the rigidness of the gameplay (switching between the beams as in Tempest) has never been a feature that I was fond of. Although the player never moves “into” the screen, Beamrider does portray itself in pseudo 3D. The only unlockable in Activision Anthology is a patch. Originally, players had to reach sector 14 with a score of 40,000 or more points. Here, all that’s required is a score of 2,500 or more points on game 8.